VATICAN CITY (CNS) — Celebrating what was expected to be the last public liturgy of his pontificate two weeks before his resignation, Pope Benedict XVI preached on the virtues of humility and Christian unity and heard his highest-ranking aide pay tribute to his service to the church. Coming two days after Pope Benedict announced that he would be the first pope in 600 years to resign, the Mass inevitably took on a valedictory tone. “For me it is also a good opportunity to thank everyone, especially the faithful of the diocese of Rome, as I prepare to conclude the Petrine ministry, and I ask you for a special remembrance in your prayer,” the pope told the congregation, including dozens of cardinals and bishops, filling the vast basilica. The Ash Wednesday liturgy, traditionally held in two churches on Rome’s Aventine Hill, was moved to St. Peter’s to accommodate the greatest possible number of faithful. At the end of the Mass, Cardinal Tarcisio Bertone, who as secretary of state is the Vatican’s highest official, voiced gratitude for Pope Benedict’s pontificate of nearly eight years. “Thank you for giving us the luminous example of a simple and humble laborer in the vineyard of the Lord,” Cardinal Bertone said, invoking the same metaphor Pope Benedict had used in his first public statement following his election in 2005. The pope showed signs of the fatigue and frailty that have become increasingly evident over the last year and a half and which he had cited in announcing his resignation. At the beginning of the liturgy, he walked from his sacristy near the chapel that contains Michelangelo’s statue of the Pieta to the atrium of the basilica, but then rode his mobile platform to the main altar. 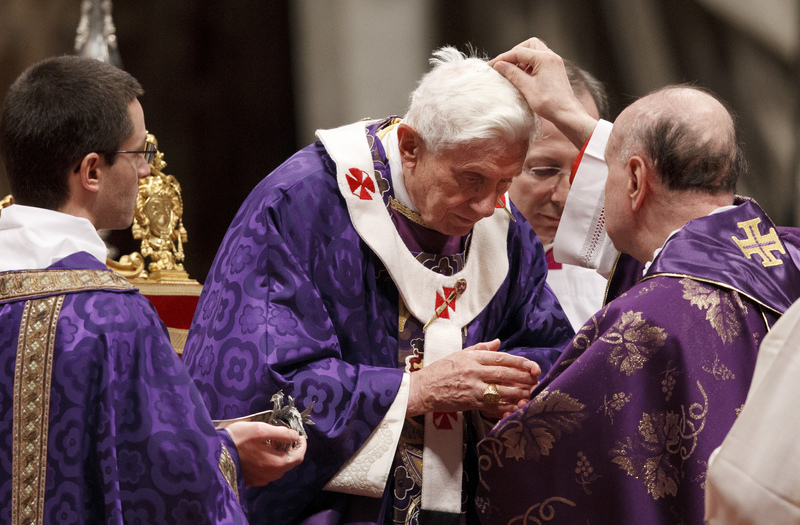 During the Mass, Cardinal Angelo Comastri, archpriest of St. Peter’s, placed the Lenten ashes on the pope’s head. The pope himself placed ashes on the heads of several cardinals and a group of Dominican and Benedictine priests.